This time it was my son's birthday; and since I'd made three cakes in a row, I thought I'd keep it easy and also "change it up" a bit. Because my son loves cherries, I thought I'd do a twist on the black forest cherry cake I'd made for him in the past and make a dessert everyone loves...trifle! It's Not A Pie...It's Trifle! Make Sure I Get A Little of Everything! First Things First...Chill the bowl for the whipping cream. Cream the butter and sugar until light and fluffy. Scrape the bowl. Sift together the flour, baking soda, salt and cocoa. Add the dry ingredients alternately with the buttermilk to the creamed mixture. Scrape the bowl. Stir in the vanilla and warm water. Spray a 13"x9"x2" baking pan with the non-stick baking spray. Mix the brandy with the cherry pie filling. Set aside in the refrigerator. In the chilled bowl, whip the cream and powdered sugar until stiff peaks form and the mixture holds its shape. Set aside in the refrigerator. This makes enough for a large trifle. I used a medium-size trifle bowl which measured 7 1/2" x 4 1/4", and I had enough left over for one extra layer of trifle (which went home with the birthday guy!). The proportions offered on the layering are for a trifle bowl similar in size to the one I used. Cut the cake into about 2" chunks. For the first layer: Fill the bottom of the bowl with one layer of the cake chunks. Spread about 1 c. of the cherry filling over the cake. Spread about 2 c. of the whipped cream over the cherry filling. For the second layer: Repeat the above: cake, cherry filling and whipped cream, but use about 1 1/4 c. of the cherry filling and about 2 1/2 c. of the whipped cream. Sprinkle the top with about 1 TB of the grated chocolate. Refrigerate until ready to serve. Enjoy all the jaw-dropping raves as your trifle makes it's grand entrance! Happy birthday to your son, Bonnie!!! What a gorgeous dessert...I adore trifle, too...and this black forest version looks incredible! Trifle is always so good and makes such a smashing presentation! Thanks! Yes, this is truly a gorgeous dessert, Bonnie!!! It's been years since I've done anything like this but you've sparked my interest when I see the pictures you've posted. However, my glass dish got broken last year so I'll have to spring for a new one, I guess. (I do have a pretty crystal casserole dish that would do nicely, it's just not a pedestal dish like yours.) BTW, your chocolate cake recipe looks simple but with the buttermilk and all the eggs and butter, it will be oh so rich!!! Hey Betty! Go ahead and use the crystal casserole dish if you think it's tall enough, regardless if it doesn't have a pedestal...if you want it to look elevated, just find something like a lazy susan to support it. The cake I used is actually a light chocolate cake, and you'll find it very tender. Your cake looks delicious and decadent. You're the first blogger I've seen who was familiar with the buttermilk substitute. Thanks for stopping by and your comment...always good to see you! It's pretty easy to make also...but you don't have to tell your guests...enjoy! Can you believe I've never made a trifle before? Crazy, I know. This must change! Thank you for sharing with me! I hope you are having a blessed day. Hi Monet! I'd love to see you make your version of trifle...I can imagine it would be something magnificent! Hope you're having a good day also! Wow, your son is one lucky guy - I love this trifle! I have a gorgeous trifle bowl similar to yours, but haven't used it yet. I'm almost ashamed. 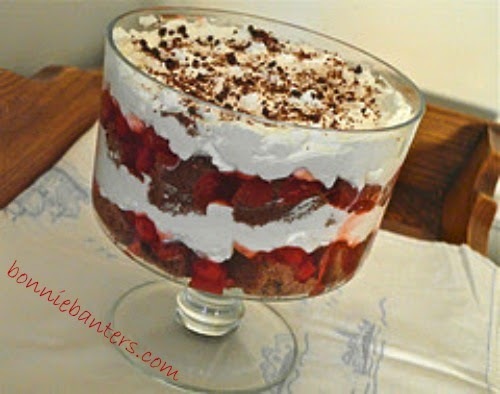 I love the idea of Black Forest Trifle, so your trifle may be it's Christening! Hi Lisa! I'm glad this trifle has inspired you to use your bowl. I love utilizing all the pretty things I have...thank you so much! Enjoy! What a gorgeous trifle Bonnie! What a way to celebrate!